Some days ago I wrote about my GTD Journey so far. I guess I forgot to mention one Blinding Flash of the Obvious (as David Allen puts it). In the evolution of (the core of) my GTD system/tools, I feel like I have finally realized what it’s all about – as David says himself, you only need a good list manager that is fast, fun and easy to use. This list manager could be low tech, mid tech or high tech, that doesn’t really matter. Currently I am using a high tech list manager, but I would feel equally comfortable with just plain pen and paper. And boy, have I been making lists lately! The power of making lists (other than your next action or projects list) has finally hit home for me. There is one particular list I made that I would like to share with you. I am still in the process of building my A-Z reference system. This is a never-ending process of course, but I have gotten to the point where at least all of my current stuff is neatly organized. 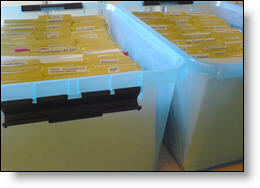 Basically, my reference system consists of two large plastic baskets which contain over 100 separate tabbed folders each (see the crappy picture at the beginning of this post). All neatly labeled with my Brother labeler, of course . Retrieving current information or storing new information has become very effective with this reference system. If my reference system was all I ever got out of GTD then I would be happy already! In the beginning I made the decision to create just one alphabetically sorted reference system, which contains personal information, clients, project support material, etc. That is, I decided against creating separate reference systems for each of these categories. My reference system currently holds more than 200 folders which could easily be increased rapidly if I would ever start to process and organize all of my “old stuff”. Finding a specific piece of information can become a little bit annoying with so many files. Did I file that under P for “Project X” or under X for “Project X”? Determining if I have already created a specific folder for a specific topic can be even more annoying. I found myself flipping through all 200+ folders on more than one occasion! List manager to the rescue! The solution is simple and obvious as are most brilliant ideas . I just created a huge list of all the labels on all of the folders in my entire reference system, i.e. an index to my reference system! Quick tip: I didn’t want to bother my wife so I just read all labels to myself and recorded them on my PDA – then played them back and entered them directly into my list manager. Then I spent about 5 minutes to assign all 200+ folders to about 5 discrete categories on the list, e.g. Personal, Client, Project, etc. The benefit of it all? This small investment in time will surely pay off for me (it already has). If I am wondering under what exact phrase/word I filed a specific piece of information, I use my list manager to quickly search the index of my reference system. If I am wondering if I already created a folder for a specific topic or not, I do the same. If I want to know if all of my clients have their own folder in my reference system, I use the filter option in my list manager to show clients only. No more flipping through hundreds of folders for me! Additional tip: add keywords to your index. In case you don’t remember how you’ve labeled something, you’ll be able to search your index for alternative words associated with what you’re looking for. I can not relate to your blog other than I could do with a better system as time is always short somehow.. Maybe I should read this blog a few times until I find solid ground to start off from. I do get a lot done now that I am retired. Never done so much in my life… OK I know it is not a good idea to wait until retirement to do things. In short. Keep up the good work, I hope you make a difference in the lives of many young people. I appreciate your post, but I just don’t see the need. It’s a question of ROI. Every time you create a new file, you also have to add it to your index. Ditto for removing a file, or archiving it to a different filing cabinet. So it’s very easy to get out of sink, or to slow your filing down. And the reason? I’ve not had a problem finding files, and I have about 100 at hand, and another 200 in a second drawer. That said, you may enjoy checking out the Paper Tiger system – it does a lot of what you’ve already figured out. Good thinking. I’ve started adding tags to the “notes” field in my list manager for just this purpose! I hope I can also make a difference in the lives of older people. There is no age limit to GTD! You’re quite right. It’s been working for me so far, but I can see myself getting into trouble (and out of sync) because of the reasons you mention. Maybe it’s not so much of a problem right now because my reference system has kind of reached a “critical mass”… I’m not adding tens of folders each day any more. Either that, or I caught the “let’s make another list!” virus And perhaps I need a more rigorous system for labeling my reference folders! I haven’t heard about the Paper Tiger system before, but I located it on the internet and put it on my someday/maybe list. Thanks for the tip! This is great…..that you are journaling your experience as you implement gtd. I have been using the gtd system for over a year now, and it has changed my life. Creating a reference system for all my old files is the one thing have not conquered. I have been working on creating a reference system that just uses tags, but I seem not be the best at making a tag that is consistent…i can think of about 12 different tags for one piece of paper. I thought it might be a burden to index my reference system but it has just been a very easy way to locate folders on topics I almost forgot I had. If you are using a digital system to index your physical reference system, why not give them all the tags you want since you can easily find them again, right?